Pajama Press is pleased to announce that Nix Minus One by Jill MacLean and Graffiti Knight by Karen Bass have both been selected for the Ontario Library Association Best Bets Young Adult Top Ten list. The Stowaways by Meghan Marentette, with illustrations by Dean Griffiths, is a Junior Fiction honourable mention. 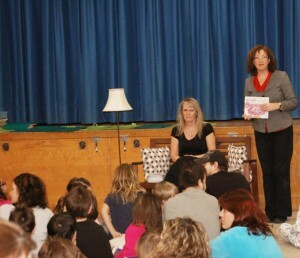 A small school in North Bay, Ontario hosted a remarkable event for Family Literacy Day this week. Inspired by the Family Literacy Day booklist compiled by the Canadian Children’s Book Centre, a teacher at J.W. Trusler Public School decided to organize a “Snuggle Up and Read” event, inviting parents to bring their pajama-clad children to school in the evening for cookies, milk, and story time. The evening’s feature family-themed book? Hoogie in the Middle. 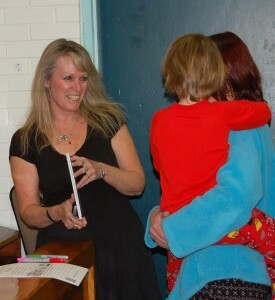 Stephanie McLellan, author of Hoogie in the Middle, heard about the event. Undeterred by a long, snowy drive and the expectation of a small audience (J.W. Trusler only has about 150 students), she decided to attend herself. The school staff, eager to welcome an award-winning author, spread the word to families, baked cookies, and acquired enough milk and books for a crowd. Pajama Press salutes Debbie, Stephanie, and the CCBC for doing so much to encourage literacy and a love of books among children and their families. “An adventure-seeking mouse leaves the safety of home to search for his missing grandfather in the terrifying World Beyond, with perilous consequences. Rory Stowaway has grown up in the protected Weedle Mouse community, but he knows “his own life [is] meant for adventure.” Unlike the Weedle mice who scorn them, the Stowaways have “always been known as great explorers.” But ever since Grampa Stowaway disappeared on a caper into the World Beyond, Papa has refused to take Rory and his twin brother, Morgan, exploring, as Terrible Things could happen. However, their Gran’s determined to search for Grampa, and Rory knows he must help her. With remarkable finesse and guts, they begin an incredible odyssey that carries them into a zoological museum and a scientific lab, where they are captured and barely escape through the mail. Meanwhile, Morgan initiates a search for his missing twin, and soon, the whole family’s involved, but not before a flood threatens their lives and home. Although the World Beyond proves as dangerous as Papa predicted, the diminutive but feisty Stowaways are up to the challenge. Black-and-white pencil illustrations capture the Stowaways in action. Click here to learn more about Kirkus Reviews. “As he did in No Shelter Here (2012), Laidlaw offers a brief history and basic details about a particular kind of companion animal (in this case, cats) and recognizes individuals and organizations who advocate and care for them. Feline fanciers and casual browsers alike will be attracted by the numerous photos—generally three to seven per double-page spread. Posed or candid, stock photos or personalized portraits, the pictures vary in size and placement but are crisp and colorful for the most part. They showcase oodles of cute cats and playful kittens, some accompanied by the humans who love them. The text, meanwhile, explores a variety of related topics, each covered in a few short paragraphs. From a young girl in China who speaks up against animal exploitation to Canadian and U.S. citizens, primarily children and teens, who volunteer in shelters, raise funds or tend to feral cats, the author profiles people making a difference. He also explains how cats behave, what they need and how readers can help. The friendly, conversational tone begins in the first few pages with a personal note that addresses readers directly and continues throughout. Backmatter includes a “Cat Lover’s Pledge” as well as a page of Web resources, a glossary and an index. “The Stowaways tells the story of twin brothers, Rory and Morgan Stowaway, and their family, which includes Mama, Papa, Gran, and their little sister, Bimble. They are Weedle mice, and they live next to a Cranberry Bog near Biggle’s farm. Unlike the other Weedle mice around them, The Stowaways have a strong spirit of adventure. At the beginning of the story, the reader learns that Grampa disappeared while on an adventure with Great Aunt Hazel, and is believed to be dead. Consequently, Papa has become extremely cautious and concerned for his family’s safety, limiting their travels and trying to restrain their natural inclination towards adventure. However, this restrictive parenting cannot stop Rory and Gran, who go searching for Grampa after discovering clues relating to his possible whereabouts. When they get captured by humans at the Museum of Natural Curiosity and do not return home, Morgan goes after them without telling Mama and Papa. The result is an exciting adventure that brings the family closer together, reignites all of their adventurous spirit, briefly reunites them with Grampa, and finally, sends them all off into the great unknown when a storm destroys their home. Marentette has created a lovely world that combines animals and fantasy with humans and reality in an original and lively story. Her writing style is elegant yet conversational. Each character has been given a unique and vibrant personality, and the reader is carried through the story caring for their well-being and excited to see what precarious situations they find themselves in next. Griffiths’ simple, black-and-white illustrations jump off the page and add another dimension to this beautiful book. Rating: E—Excellent, enduring, everyone should see it! “Cat Champions is a compilation of stories of children who have made a difference in the world by caring for feral cats. The book is divided into sections to highlight different types of stories, from the lives that cats have when they do not live in a home, to shelters, to becoming a foster parent, and to adopting a cat and raising funds for cats who need help. Interspersed throughout the book are sidebars with information that provide readers with statistics and concrete information on the world of cats and how to look after them.